Thank you for your interest in the Cat Fanciers' DNA Testing program through Neogen's GeneSeek® Laboratory. This page will walk you through the ordering process, but if you have any questions, please don't hesitate to contact us via email at GeneSeekInfo@Neogen.com or by phone at +1 (402) 435-0665. Each sample submitted for testing is processed on the "Cat Fanciers' Association Basic Panel". A list of the components of this test are listed here. Specific "Add-On" tests can be selected individually for an additional nominal fee. Click here to view available Add-on tests. A single sample submission typically provides sufficient DNA for all tests. 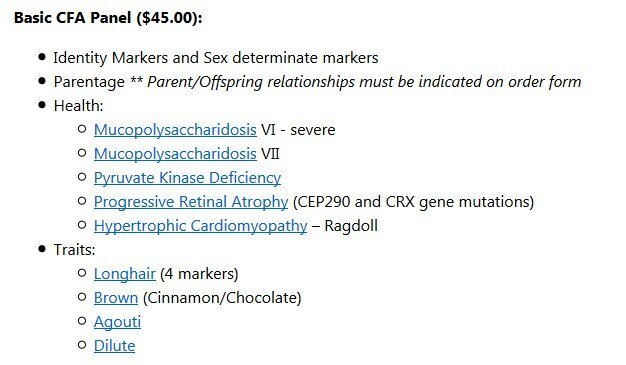 Cheek swabs and blood samples are acceptable sample types and at the end of the order process you will receive instructions on how to collect and send samples. Here is a preview of what is involved in sample collection. Not all markers apply to all breeds, and there are many other considerations to take into account when interpreting results. 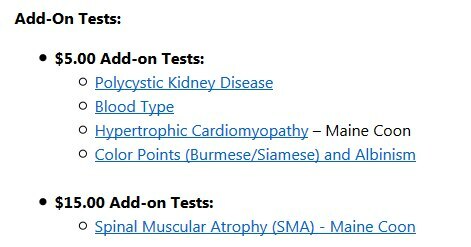 Find more details about test options at www.catDNAtest.org. which are copyright by the individual photographers.